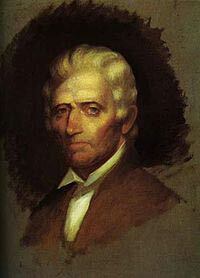 Daniel Boone was an American frontiersman and explorer, best known for his travels in what is now Kentucky. His most famous journey came in 1775, when he established the Wilderness Road across the Appalachians. This succeeded despite fierce opposition from several Native American tribes. Boone’s daring exploits and frontier spirit made him one of the United States’ earliest folk heroes. Boone was born in a log cabin in Exeter Township, Pennsylvania on November 2nd, 1734. His father was an English emigrant who worked as a weaver and blacksmith. As Daniel was the sixth child of the family, his parents could not afford to give him a formal education, although he did learn how to read. His father gave him a rifle when he was twelve, and he showed immediate promise as a woodsman. By the age of 15, he was running a hunting business in North Carolina, where his family now lived. Boone’s first expedition was in the army, under Brigadier General Edward Braddock during his disastrous 1755 campaign in the French-Indian War. Boone himself almost lost his life when ambushed, but used his survival skills to make it out alive. The following year, he married settled in the Yadkin Valley. Boone seemed content, raising six children, but he eventually started to yearn for a return to the adventurous life he had once craved. The first expedition Boone led was a relatively short hunting trip along Kentucky’s Big Sandy River in 1767. This reached Floyd County, but two years later Boone would embark on a longer and more historically significant journey. With teamster John Finley, an old army comrade, he led a team of four other men to find a way through the Appalachian Mountains to the far western frontier of America. Boone’s party discovered that there was a trail through the Cumberland Gap, which had the potential to be used for journeys of settlement. Having blazed the new Wilderness Road through the gap, western Kentucky was open for settlement. In April 1775, Boone set up a fort in a new Kentucky settlement, which he named Boonesborough. The fortified nature of the settlement was a necessity, as some of the Native tribes in the region were known to be hostile to Europeans. Later that year, Boone’s family joined him in the new village, of which he himself now acted as leader. An increasing number of colonists settled there too, allowing it to become a substantial township. Resistance by some of the indigenous tribes, in particular the Cherokee and Shawnee people, continued for several years. In the summer of 1776, Boone’s daughter Jemima was kidnapped. He feared for her safety, as well as that of two other girls who had been abducted at the same time, but they told him after he had rescued them that they had been treated relatively well by their captors. Boone himself received a gunshot wound to the ankle during a raid in 1777, although he made a good recovery. In 1778, the Shawnee captured Boone, although he was quickly able to escape. However, when Boonesborough settlers lent him money to buy land permits, he was robbed on the way to do so. This caused fury among the settlers, some of whom sued. After several years of deteriorating relations, in 1788 Boone moved to Point Pleasant in present-day West Virginia. He served in both military and civic roles there before moving again, this time to Missouri. Here he died at 85 on September 26th, 1820.